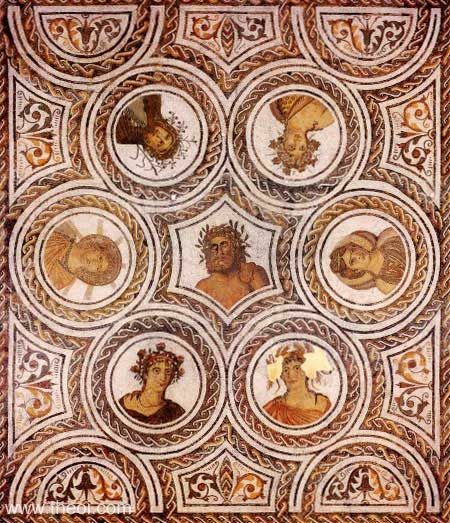 This mosaic contains portraits of the gods of time, sun, moon and the four seasons. Chronos (Time), crowned with a wreath, sits in the center. Helius the Sun and Selene the Moon are located in the central left and right panels respectively. The four Horae (Seasons) are arranged above and below the other three figures. Each wears a wreath symbolizing her season--berries for winter, blossoms for spring, ripened grain for summer and grapes for autumn.